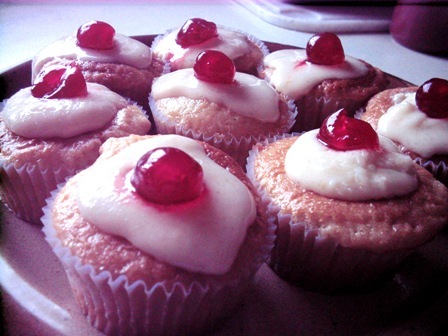 I baked some cupcakes. So light and fluffy, lemony, intensely delicious, originally vegan. I used a great recipe from ‘Veganomicon’ by Isa Chandra Moskowitz. They contain lots of lemon juice and zest and vanilla. I used macadamia oil instead of butter. The batter was runny, but the lemon, bicarb soda, milk (I semi de-veganised it) and baking powder sort of did their chemical thing and it all set firm, but light, with a nice translucent crumb. No one would believe they had no egg inside. ‘What’s the frosting?’, I hear you ask. Cream cheese, lemon juice, sugar and lemon zest.